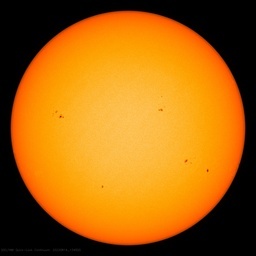 NASA GISS and "pesky sunspot correlations continue" | Watts Up With That? NASA GISS and "pesky sunspot correlations continue"
Researchers say they’ve found puzzling correlations between changes in the sun’s output and weather and climate patterns on Earth. These links appear to rise above the level of misinterpreted data or faulty equipment. “There are some empirical bits of evidence that show interesting relationships we don’t fully understand,” says Drew Shindell, a researcher at NASA’s Goddard Institute for Space Studies in New York. For example, he cites a 2001 study in which scientists looked at cloud cover over the United States from 1900 to 1987 and found that average cloud cover increased and decreased in step with the sun’s 11-year sunspot cycle. The most plausible cause, they said: changes in the ultraviolet (UV) light the sun delivers to the stratosphere. September 27, 2007 in Climate_change. Are there associated plots? Calculations and plots of annual mean albedo? Mean albedo vs. GISSTemp? Any solar correlation is much stronger than any CO2 correlation, yet they hang their hat on CO2. Nice to see they’re up on current events. Hershel noticed that over 200 years ago. First, can we trust an article on solar activity from a man named “Spotts”? I have heard (and have accepted) that TSI increase cannot account for the current (alleged) rate of GW. But allow me to leap from blind faith to crude reasoning. The increase in TSI of a wee bit over 0.02% per decade over the last c. 30 years, acc., to that there article. NOAA alleges a 0.06C/decade increase (over the last century). And what percentage (Kelvin) increase is THAT? A wee bit over 0.02%! And what, my fine, feathered friends, do we have here? One of two things. A.) My math is off by a factor of 10s (and Lord knows, it wouldn’t be the first time)! B.) A highly limited, but darn near-exact percentage track Between TSI increase/decade and NOAA-alleged increase/decade! Can one relate TSI and temp increase on a 1-1 basis? Hmm.? Or does only heat output count?